The meeting took place June 14, and was the first in a series of meetings dedicated to religious freedom hosted by the US Embassy to the Holy See. In her initial remarks, Callista Gingrich, US Ambassador to the Holy See, strongly condemned Russian aggression on the Ukrainian territory. Shevchuk mentioned current problems in Ukraine, among them the fact that there are thousands of children in direct exposure to explosive material, a constant risk of being targeted for airstrikes, and the pollution of water supplies stemming from underground nuclear explosions during the Soviet era. The head of Greek Catholic Ukrainian Church also spoke about the need for religious reconciliation in Ukraine. “We do not just need to pray for reconciliation. We need to do effective acts of reconciliation. This is crucial,” Shevchuk said. 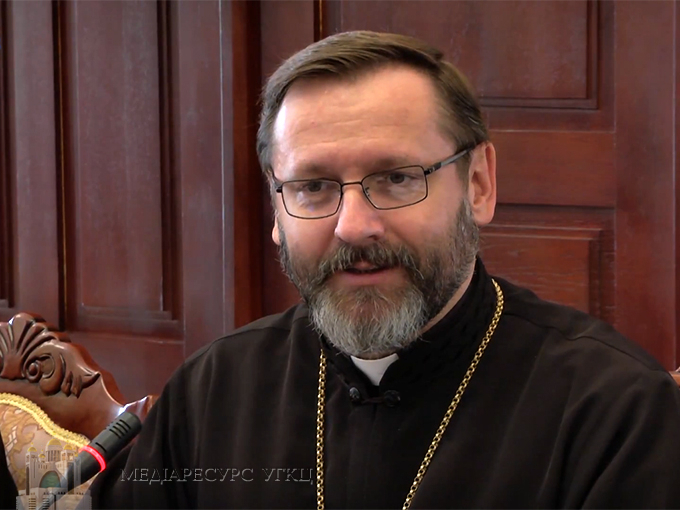 Shevchuk also noted that “chaplains are in the frontline to help soldiers to be converted to love, not to hatred,” and stressed that “the process of justice and reconciliation should start. We try to foster that process, we preach forgiveness even for our enemy, and we try to share the experience of other countries. We are convinced that dialogue can heal the wounds." The archbishop emphasized the need for ecumenical dialogue in Ukraine, especially with Orthodox Christians, who are deeply divided in the country, especially after a disagreement over the relationship between Ukrainian and Russian Orthodox Churches. That disagreement has become a contentious debate involving the Orthodox Patriarch of Moscow, Ukrainian president Petro Poroshenko, and the Ecumenical Patriarch Bartholomew I. The head of Greek Catholics of Ukraine discussed the roots of the current disagreement: a request from some Ukrainian Orthodox Churches for independence from affiliation with the Russian Orthodox Churches. “There are some inner tensions in each Church as well, but thanks to be to God until now we have religious peace among us,” he added. He then praised a Ukrainian NGO, the “Council of the Churches and Religious Organizations” that “can help us to meet and to cooperate together for the common good of the Ukrainian society." He added that, despite Ukraine’s struggles, he has hope. “We are Christians, we trust in God’s providence. Only God is the master of peace, and there is no peace without justice,” he concluded. The US Embassy to the Holy See will co-sponsor a June 25 conference on religious freedom, which will take place at the Pontifical Holy Cross University in Rome.